This will be short and to the point…I came to Punte de Este for the beaches and a holiday from my travels and mission accomplished! I didn´t realize how tired I would be from my two week stop over in the USA visiting so many people and traveling all around northern California and then flying to New York for a few more days of running around, but when I got to Argentina to meet my dad and brother I was exhausted. Then I became even more exhausted as the three of us ran around to see a lot in two weeks. So off to a three hour ferry to Montevideo,Uruguay and then a two hour bus to get to the uber cool and hip beach side community of Punte de Este. This is where the rich and famous go to relax, and now I understand as it was so expensive (well some things). Well I think I did all of that as I am tanner than when I arrived, I got one of the cheapest and best wax jobs ever, and I could say I buffed it as I walked all over town so I got some exercise (I guess – that is a stretch) and then I did plunk my body down on 4 different beaches in 2 days…So I guess I lived the Punte de Este dream! I found a great hostel that was one block from the beach and right in the middle of town, so I was happy and my first night when I arrived at 11pm, I met Claudia who was from Buenos Aires and was here on holiday as well. So we headed out to dinner just after midnight (yes they really eat that late and there were still many people and families with young children coming in to eat after we sat down). Claudia and I had a great dinner and she told me more about her favorite parts of Buenas Aires so I can enjoy that when Colin comes to join me on February 21st. I laugh as Claudia and I came back from dinner at 1:30 in the morning, and this was after walking the main drag and there were so many people out that were just started to head to clubs, but all I wanted was bed! My two days in Punte de Este consisted of me going to the beach, relaxing, reading, drinking, and trying to find some meal that was affordable! Food was the most expensive thing I came across in this city. I´m sure accommodations were, but my dorm room on the beach was only $17 US so that was great! -Wax 150 peso ($6)- this was unreal to me. Couldn´t believe how cheap it was!!!! 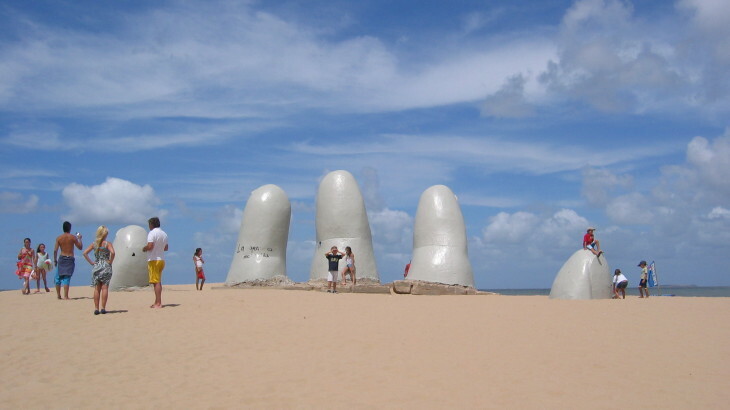 I also went to see the one big sight in Punte de Este and this is a famous sculpture on the beach of the hand and fingers coming out of the sand. From far away it´s eerie and looks like it´s really coming out of the sand. I was able to see it from a distance this morning on my way to the bus station as there were no tourist around it at 8am. It was a funny thing to see on the beach! My last evening in Punte de Este I decided to go watch the sunset over the Rio Plata and it was a beautiful bright orange sunset and then was out in search of the local food. It´s a sandwich called a “Chivitos” and essentially has everything under the sun, except the kitchen sink in it. Most have beef, but I didn´t want this and one of the famous place had all sorts of meat. So my Chivito complete had the following: chicken, ham, hard boiled egg, cheese, bacon, mushrooms, olives, tomato, lettuce and special mayo sauce. Then it´s put under a broiler to melt together and was so tasty. Maybe it was all the grease, mayo sauce that I never eat. It was super great! Thanks for the suggestion to get one of those Milena! Even though two of my friends didn´t care for Punte de Este and said to skip it *as just (like Miami beach and super expensive), I was glad I went as it was the perfect weekend at the beach for me and now I´m ready to go to Antarctica tomorrow. Still can´t believe I´m going from the beach to the ice with a few days, but it should be a great adventure. So I´ll be on my way to Antarctica from Feb 10-21 with little to no communication. I´ll make sure to update once I´m back!